"Electric communication will never be a substitute for the face of someone who with their soul encourages another person to be brave and true." (Bel Air, MD – July 2, 2014) Stephanie Novak Hau, president and CEO of Chesapeake Environmental Management, Inc. (CEM), was recently named the 2014 Maryland Small Business Person of the Year by the U.S. Small Business Administration. 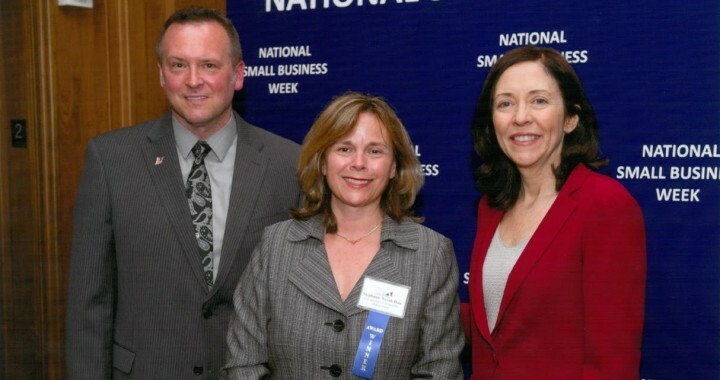 Since 1963, contributions made by the small business community to the American economy and society are recognized during National Small Business Week, when an award is presented to a business from each U.S. state and territory to recognize outstanding contributions. Starting in 1993 with two employees, to today with more than 50 employees, CEM commits to “applying practical science to improve communities” through private and public partnerships providing technical services to aid and support the creation and maintenance of community infrastructure. CEM’s engineers and scientists work efficiently to deliver solutions that are beneficial and responsible to our fellow citizens and the communities we share. Over its 21-year history, CEM has received numerous local, state and national recognitions both as an organization and individually for its president and CEO. To Hau, these are simply the outcome of focusing more on what CEM can contribute rather than what CEM can obtain. Generously sharing profits with employees, matching employee personal charitable donations and contributing five percent of their annual earnings to non-profits that strive to improve the human condition allows CEM to live the philosophy of giving back to the community. Next week, CEM will award 2014 grant funding awards in excess of $180,000 to local charitable and civic organizations that provide support and services in the community. Hau has engrained this philosophy into the core mission of CEM and wishes to share this vision with other small businesses to encourage them to do the same. The majority of large companies began as a small venture – one person’s idea – with the hope of rising up to solve a problem or satisfy a need. Hau will continue her quest to encourage all Americans to support and celebrate small, local businesses and inspire entrepreneurs to support each other. Chesapeake Environmental Management, Inc. (CEM) is a full-service environmental consulting firm providing the technical expertise and regulatory knowledge to help protect, restore, responsibly develop and manage land and water resources to improve communities. Serving as a trusted environmental advisor, CEM supports clients who require services to responsibly manage the natural resources that affect their business concerns. Solving clients’ environmental challenges, CEM carefully considers the complex inter-relationships of the environmental sciences, including: geology, hydrology, ecology, geomorphology, geography, and engineering.